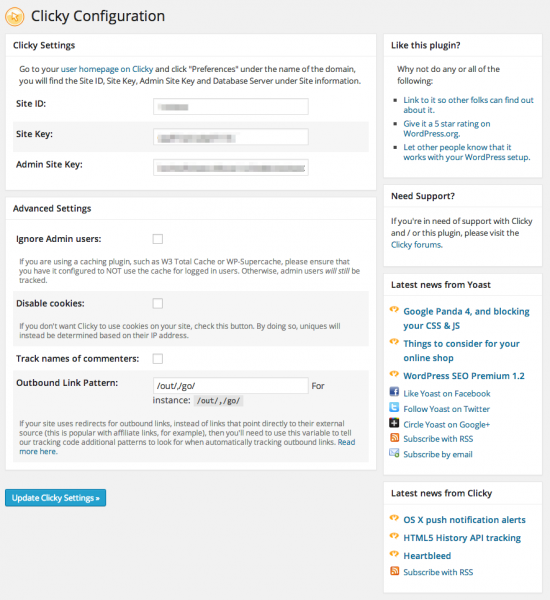 The Clicky for WordPress plugin by Yoast makes it easy for you to add your Clicky analytics tracking code to your WordPress install, while also giving you some advanced tracking options. Click the link that appears or go to Settings -> Clicky and enter your Site ID, Site Key and Site Admin Key, you can find those on your Clicky homepage. Ignore admin users makes Clicky ignore the admin user when he’s logged in. Track names of commenters allows you to see the names of people who commented on your site in your Clicky Analytics. The outbound link pattern option allows you to track certain kinds of links as outbound links, when they’re actually internal. This is useful when you redirect, for instance, your affiliate links through a /out/ or /go/ redirect script or plugin locally.